This page is to showcase my web design works I have done. All of them are W3C HTML 4.0 and CSS compliant so as to maximize cross browser compatibility. 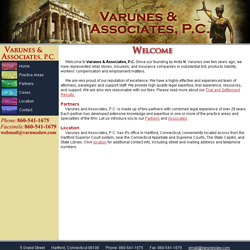 Varunes & Associates, P.C. : This website is for local law firm whom I had worked at as a part-time receptionist over the summer during high school. They wanted me to do a website for them to attract more business, so I made up a layout based upon what they liked in other law firm websites and their own suggestions and ideas. Then I got their opinions on what to change to make it look how they wanted, added in content, tweaked things here and there, and eventually ended up with what you now see on their site.